“Evelyn Rydz: Forever Yours” is a provocative exhibit of drawings and photographs by Boston artist Evelyn Rydz at the MFA. Pictured, “Oceanfront” (detail). Kamilo Beach, on the southeast coast of the island of Hawaii, is more perdition than paradise. Plastic trash blankets the shore. At its worst, before regular cleanups started in 2003, the debris topped out at 8 to 10 feet high. Now, several cleanups a year remove tons of plastic from the area. The job is never done. 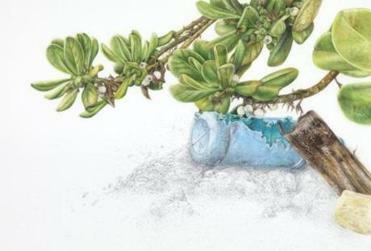 For Boston artist Evelyn Rydz, who documents flotsam and jetsam in meticulous drawings, Kamilo Beach was a destination. “Evelyn Rydz: Forever Yours,” the latest small show at the Museum of Fine Arts spotlighting a graduate of the School of the Museum of Fine Arts, documents her trip there. The bulk of this trash doesn’t originate from Kamilo Beach litterbugs. The beach is hard to reach and the sands are hardly pristine and inviting. No, it’s an unfortunate port of call for the massive accumulation of plastic in the Pacific Ocean, churned and transported by the North Pacific oceanic gyre. Much of the colorful junk is discarded or lost fishing lines and nets. Then there are plastic bags, bottle caps, toys, and masses of tiny bits of broken-down, unidentifiable plastic. The stuff strangles and digs into the skins of marine mammals, fish, and birds. Its poisons infiltrate the food chain at every level, including our own. We’ve arrived at the other side of the “great future in plastics” predicted by the guy offering career advice to young Benjamin Braddock in “The Graduate,” and it isn’t pretty. Except that it is, in Rydz’s remarkable rendering. It’s lovely and bizarre, familiar and shocking, all at once. Rydz is a draftswoman, and her drawings get ever better and more precise. We’ll get to those in a minute. For this show, she has also put down her pencils and, through a microscope, photographed some of the minuscule shreds and chips of plastic she brought home from Hawaii. The gemlike images in the “Floating Artifacts” series glow, suspended on a deep black backdrop, lovingly washed with light. At 3 feet by 4 feet, they’re the largest works in the exhibit. Rydz elevates barely visible scraps of detritus into the realm of iconography. “Floating Artifacts, 8” depicts a gnarly length of aqua-green plastic with a network of some wee organisms growing over parts of it. That network makes an eerie and discomforting echo to Tara Donovan’s untitled cloud of Styrofoam cups billowing above Rydz’s exhibit in the Eunice and Julian Cohen Galleria. These photos describe the intimate interaction of the plastics and the sea. Salt bites into the plastic, water currents soften its edges. Then life attaches to it; it becomes part of the ecosystem. As much as the plastic impinges on marine creatures, marine creatures appropriate the plastic and make it their own. Rydz has an eye for minute detail, and as such, she generally works on a small scale. The largest drawing here, the panoramic “Oceanfront,” 5 feet wide but only 18 inches tall, compels close examination. 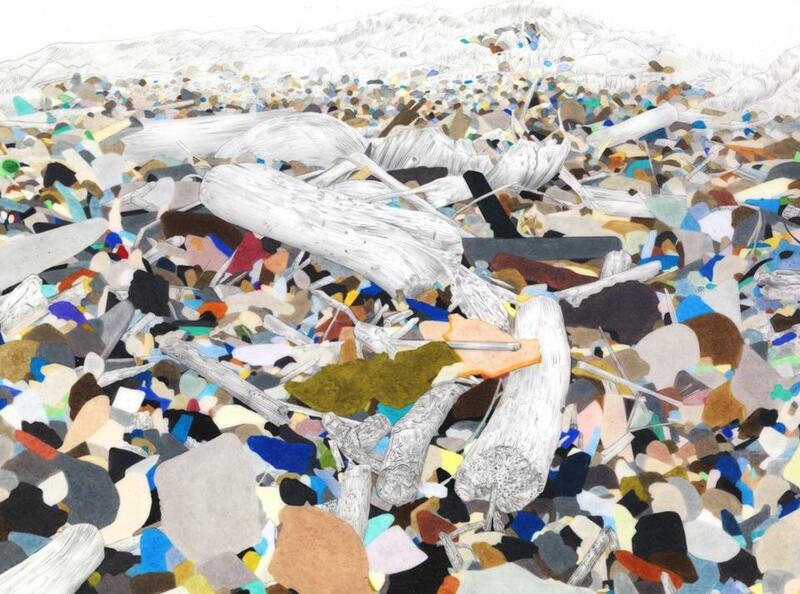 Made with pencil and colored pencil on drafting film, it depicts a sprawling heap of dazzling debris. Some of it she painstakingly details; the rest just looks like flat chips of color, especially in the near ground. There, that flatness suggests a wall, confronting the viewer — or a near-vertical pile of jewel-toned trash. Elsewhere, we see splintered logs and lengths of frayed rope — a blue one anchors the center, wagging toward us, beckoning like a crooked finger. The logs are rendered in bare graphite, popping out in gray against the shattered rainbow of plastic. Color gives way to graphite in the background, as the beach recedes. That seems wise; had Rydz filled everything in with color, the piece would have been a dense confetti shower, impossible to read. The rest of the show comprises intimate, 6-by-9-inch still lifes in the “Postcards From Kamilo” series. There’s a quality of witnessing to these drawings; they’re cool and specific. They show, but they don’t chide; they leave us to our own reactions. In “Postcards From Kamilo (Tropical Almond Tree With Bottle),” the lush, succulent-looking leaves of the tree lean over a broken plastic bottle, tender as a mother checking on a feverish child. The bottle, which lies beside a jutting piece of broken driftwood, looks scarred and shredded, the blue of its exposed insides a tropical turquoise. Other “Postcards,” like the “Floating Artifacts,” capture plastic’s encroachment on the habitat. One depicts coral resting against a weathered red bottle cap, still apparently attached to part of a bottle. Stones nestle behind. It takes a moment to discern what’s organic and what’s man-made — it all looks so unfortunately cozy together. The “Postcards” series puts a sober cast on the breezy “Aloha From Hawaii” cards sent home by vacationers. So does the title of Rydz’s show: “Forever Yours” reminds us of our fond dependence on plastic. And that we’re never going to get rid of the stuff.